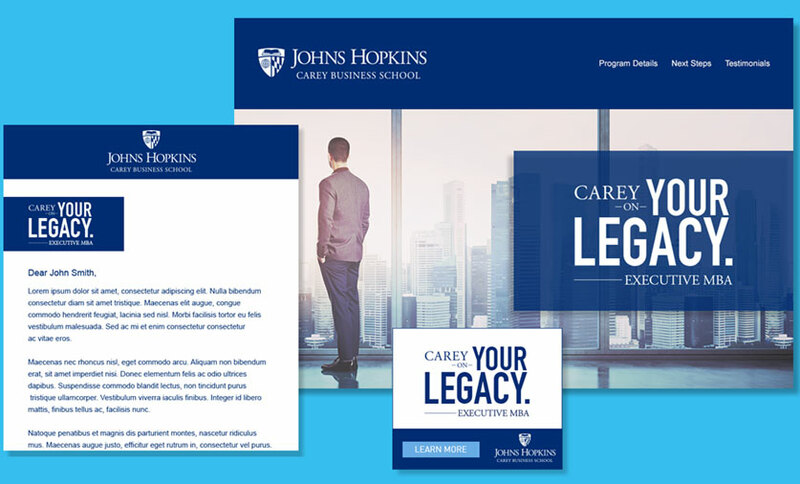 Carey is the business school for the Johns Hopkins University in Baltimore, Maryland. Founded in 2007, JHU Carey offers MBA degrees, specialized Master of Science degrees, as well as Executive Education certificates. The school has over 2,000 students from over 60 countries. JHU Carey engaged with Annodyne to help with the future relaunch of their Executive MBA (EMBA) program. As part of the initial relaunch planning, Annodyne led a program rebranding effort, centered on the development of a new tagline and associated creative that would be deployed in the program’s relaunch campaign. Annodyne led a one-day stakeholder creative messaging workshop that was held at the JHU Carey campus. Participants included Carey marketing team members as well as Carey administrators and faculty. Annodyne brand experts conducted a highly engaged workshop that explored the distinct identity and value proposition of both the EMBA program and the business school itself. The input from this session was then used by Annodyne to develop a rebranding strategy and associated creative campaign concepts. Annodyne developed three rebranding creative concepts to aid in the planning of the future relaunch of the EMBA program. The concepts were presented to the JHU Carey stakeholder team, who was delighted with the results, not to mention the Annodyne led messaging workshop they participated in.